Two posts from me in one month- say what! I know, look at me being all productive. Thank goodness for partners and collaborations to help keep that healthy amount of accountability alive. Since Halloween is just around the corner, I am in the mood to keep calm and be scary on around the house. 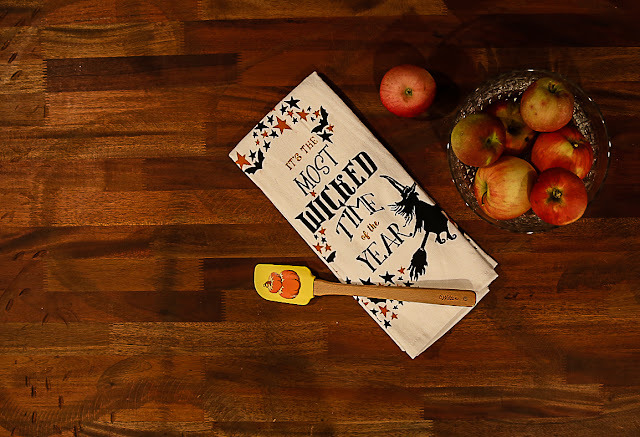 I invite you to join me on a little tour of my kitchen for this festive fall celebration. 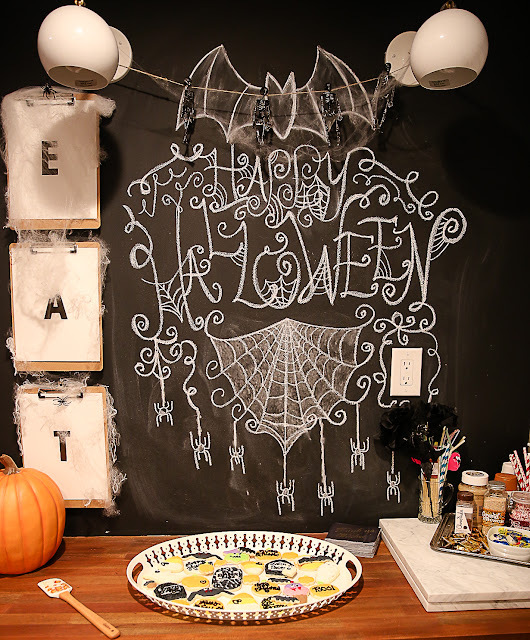 I want to start with my favorite kitchen accessory- my chalkboard wall! 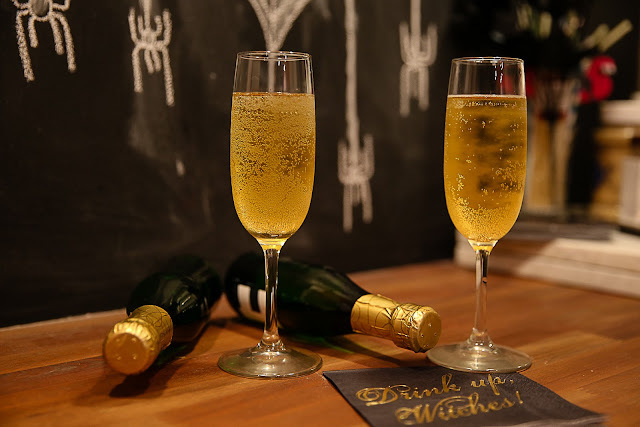 It has been so fun to change this up for each holiday to create a fun little decorative drink or snack bar. I quickly searched for some fun images on Pinterest and fell in love with this one. I know I will need to find my next idea soon since Thanksgiving is already just around the corner as well! I just used regular white chalk to create this board and smuged it a little here and there to give it more of that spooky webbed look. I also added in some skulls and fake web material to add some fun without taking too much away from the board. It is nice seeing all these decorations that can be used for almost anything at the Dollar Tree! Next, no kitchen hop can be complete without adorable cookies. 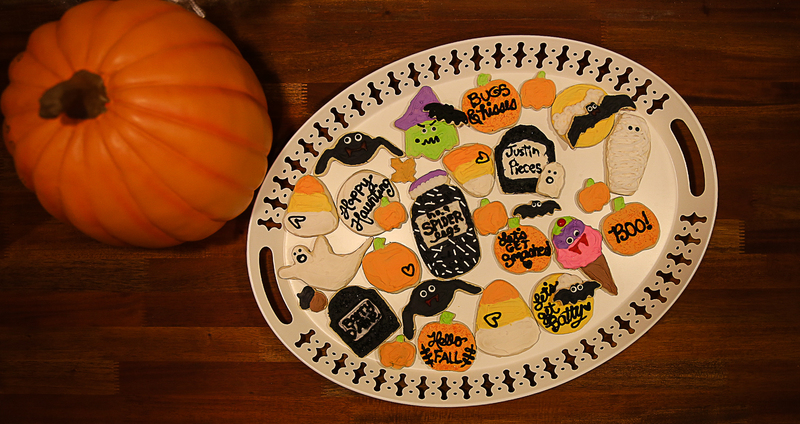 I made a fun batch of sugar cookie cut outs and decorated them with lots of ghoulishly good fun. My most favorite recipe to use for sugar cookies is from All Recipes. I have been using it for years and have had great success with it. The cookies are soft, yet sturdy and keep for quite a while. I hope to make some time soon to do a little practice with royal frosting to make even better designs on these cookies, but that has been a little difficult for me! 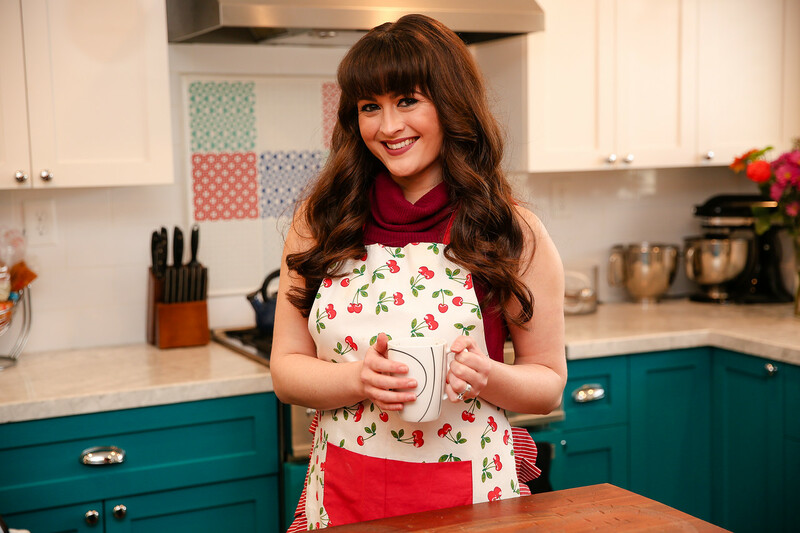 If you know a great recipe I could use, please comment below! Next, let's head over to the little bar area. 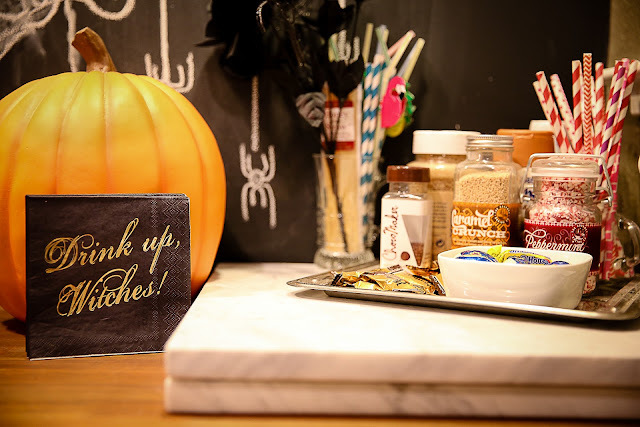 I found the cutest, most hilarious drink napkins at Marshalls that add that little extra dash of holiday sass and get your guests into the spirit. Accessories like these are usually inexpensive and really help set the mood for your guests. Even if you can't do a lot of other decor, make sure you pick up splashes of these themed accessories! Last but not least, I simply adore my holiday kitchen towels. I have quite a collection going now and think I might be addicted to them. There are usually so many different styles to pick from it is hard to select just one! This year for Halloween, I went with "The Most Wicked Time of the Year." I thought they were still magical, in a slightly scary sort of way. I also stumbled upon a few seasonal spatulas from Wilton at Walmart and couldn't resist getting them to add to my kitchen. I hope you have enjoyed seeing all the fun over in my kitchen for this Halloween and find some new creative ideas to make your home extra special during these holidays. 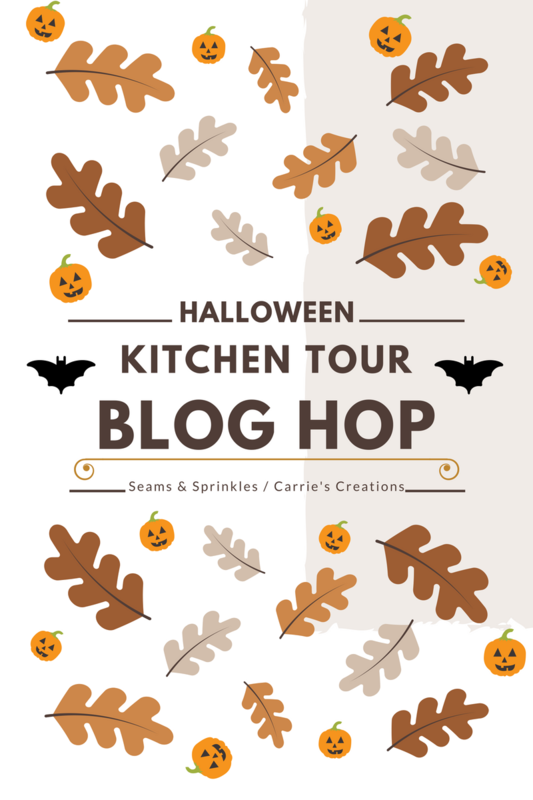 Be sure to head over to Carrie's Creations next to see the next kitchen on the tour! Thanks for stopping by and have a wonderful time eating, drinking and being scary this Halloween. Your chalk board is so cute! I've only made sugar cookies with royal icing twice-- this is the recipe I used if you wanted to give it a try! http://jennysteffens.blogspot.com/2011/12/christmas-cookies-sugar-cookies-from.html Happy Halloween, Britney! Thanks so much, Carrie! I will have to try it out ASAP! Have a happy, fun and blessed Halloween sweetie.